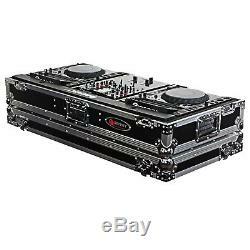 Odyssey FZ10CDJW Flight Zone 10 Mixer Dual CDJ DJ Case W/ Wheels. Odyssey FZ10CDJW CD DJ Coffin. CD DJ Coffins hold two tabletop CD players and one mixer. These ATA Rolling Consoles feature rugged built-in wheels, heavy duty spring loaded latches, stackable ball corners, and front access panels. Cabling is clean and easy through convenient access ports throughout. The Odyssey FZ10CDJW Box Includes. 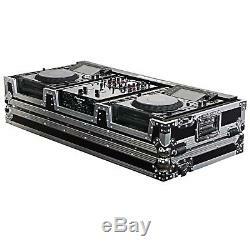 (1) Odyssey FZ10CDJW CD DJ Coffin. Approximate Dimensions (exterior): 41.125"W x 9.5"H x 19.625D. The FZ10CDJW mixer well holds mixers with a width from 8.75" to 10.5", depth up to 14.25" and 3.25" tall. The CD wells Hold players such as but not limited to. &###x2022; American Audio Flex 100 MP3 &###x2022; American Audio Radius 1000 &###x2022; American Audio Radius 2000 &###x2022; Amercan Audio Radius 3000 &###x2022; Denon DN-S3500 &###x2022; Denon DN-S3000 &###x2022; Denon DN-S3700 &###x2022; Denon DN-S5000 &###x2022; Denon DN-S5500 &###x2022; Denon DN-HS5500 &###x2022; Denon SC3900 &###x2022; Gemini CDJ-600 &###x2022; Gemini CDJ-202 &###x2022; Gemini CDJ-203 &###x2022; Gemini CDJ-210 &###x2022; Numark NDX800 &###x2022; Numark V7 &###x2022; Pioneer DVJ-1000 &###x2022; Pioneer CDJ-1000 &###x2022; Pioneer CDJ-1000MK2 &###x2022; Pioneer CDJ-1000MK3 &###x2022; Pioneer CDJ-2000 &###x2022; Pioneer CDJ-800MK2 &###x2022; Pioneer CDJ-850 &###x2022; Pioneer CDJ-900 &###x2022; Stanton C. Two Retail Locations &###x2022; One Massive Warehouse &###x2022; Thousands of Items in Stock &###x2022; Fast Free U. &###xA9; 2017 I DJ NOW. Any use of this material including all content, images and design, without prior written consent from IDJNOW, is strictly prohibited by law. This listing is currently undergoing maintenance, we apologise for any inconvenience caused. The item "Odyssey FZ10CDJW Flight Zone 10 Mixer Dual CDJ DJ Case With Wheels" is in sale since Tuesday, June 06, 2017. This item is in the category "Musical Instruments & Gear\Pro Audio Equipment\Cases, Racks & Bags".com" and is located in Ronkonkoma, New York. This item can be shipped to United States.